Merlin turns people into animals. Okay, so, I don’t know how the movie gets made today. Whatever. 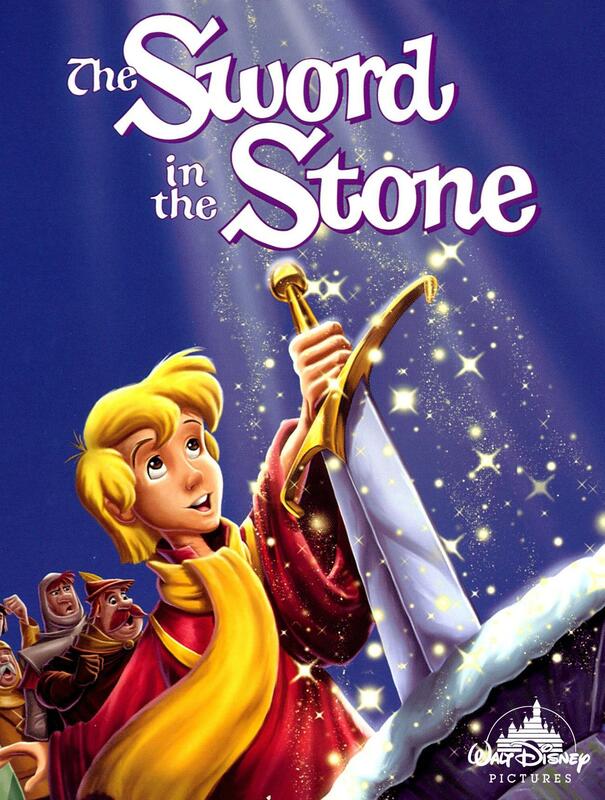 Sword in the Stone is extremely silly. I like silly, but seriously – this movie is 70 minutes of disjointed episodes followed by 5 minutes of Arthur pulling the sword out and becoming king. C’est la vie. Merlin and Arthur underwater is a grand adventure. 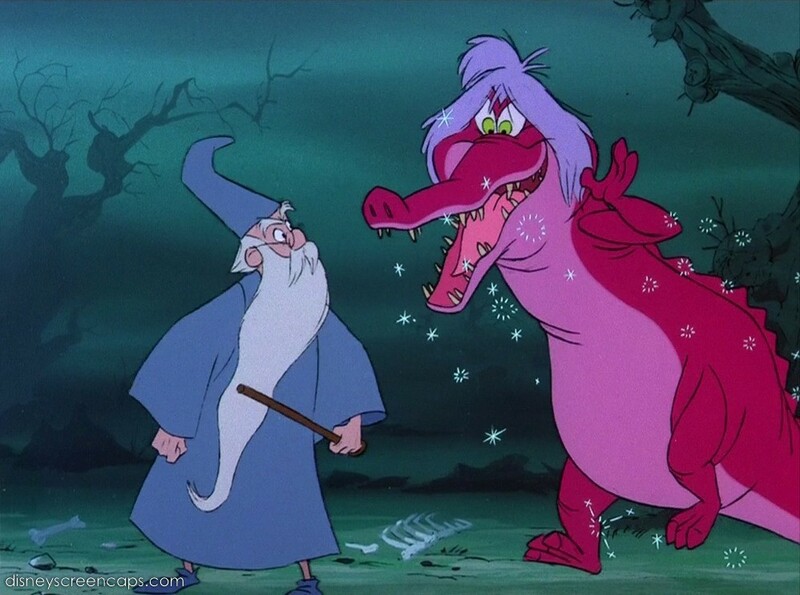 Regardless of how weird the movie is, I really liked the scene in which Merlin turns Arthur into a fish. I found it to be incredibly imaginative, and I LOVED the cinematography inside the moat. 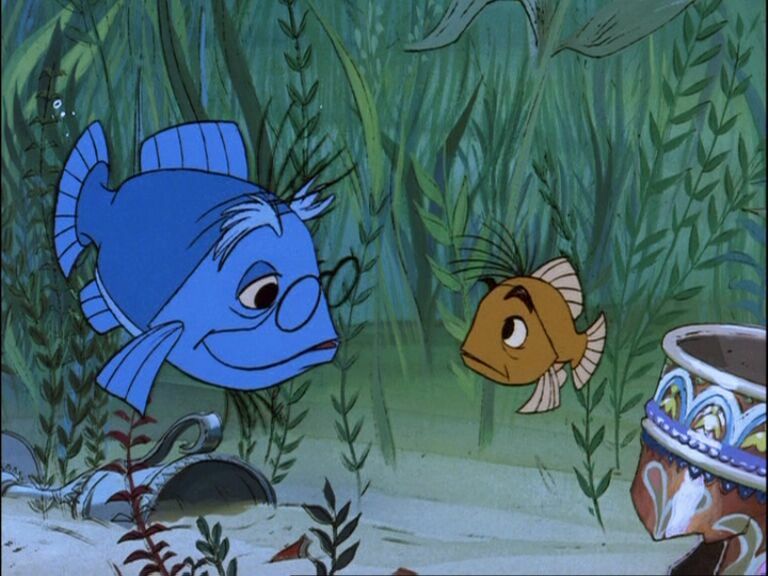 It’s not like the images can rival Finding Nemo or some other photorealistic animation, but somehow, the artists used just the right colors/shading and nailed the look. I really, really, really liked that. Something else I liked was the relationship between Merlin and Arthur, though it didn’t seem to go anywhere beyond student/teacher. I was expecting there to be adventure; needless to say I was disappointed. Regardless, I liked the interplay between the two characters – Arthur does a nice job of setting up Merlin for all kinds of magical moments. My favorite (besides the fish thing) is when Merlin convinces Arthur to let him do the dishes magically. Good stuff. In closing, Sword in the Stone is a silly movie that has hardly anything to do with its strong title and epic-looking picture on the cover. I guess the lesson is, you cannot judge a movie by its cover. Still, there were elements of the movie I liked such as the underwater section and the relationship between Merlin and Arthur. In all, this feels like a lower point for Disney. Perhaps there are some who would watch the movie and find it incredibly enjoyable (I certainly would recommend it for kids), but since I’m writing this, I’m going to give my opinion, and that is a 3.8/10. Just kidding, I’m not that biased. I would give it a 3.9/10. Jk jk. Jokes!! I would seriously give it a 6.3/10. Final answer. The Lion King is a great film. I feel like someone should make a movie called The Liger King and have the guy from Napolean Dynamite be the narrator. #amirightoramiright Anyway, so, The Lion King is amazing blah blah blah, it’s the best animated movie of them all blah blah blah it transcends the animated medium blaaaaaaaaaaaahhhhhhhh blah blah you’re heard it all before. Like, just because it has beautiful visuals, a captivating story, well-crafted characters, terrific voice-acting, a meaningful message and some of the greatest movie music ever, everyone wants to bow down before it and crown it the king of animation. I guess that means it’s my turn to praise it. UGH! 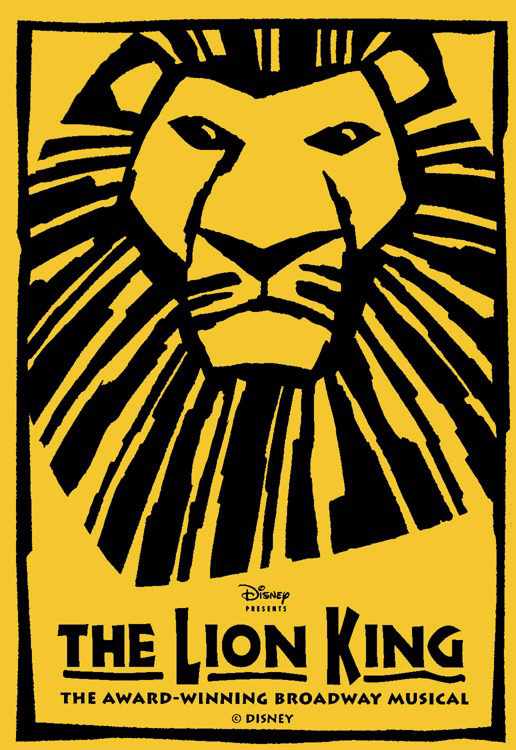 The Lion King is a Broadway musical. But seriously, this isn’t just one of the best animated films ever – it stands as one of the best and most successful films of all time. As of 2011, it’s earned $951 million at the box office, making it the highest grossing hand-drawn animated movie and the highest grossing 2d animated movie of all time, not to mention the 17th highest grossing feature film. It garnered Oscars for Best Original Score and Best Original Song, and it won Golden Globe awards for Best Picture – Musical or Comedy, Best Original Score, and Best Original Song. It spawned the 6x Tony Award-winning Broadway musical as well as the only Disney soundtrack to be ‘Diamond’ certified (1ox platinum). Basically, this movie was and is a juggernaut. Like I said above, the movie has beautiful visuals, a captivating story, well-crafted characters, terrific voice-acting, a meaningful message and some of the best movie music ever. I want to touch a little on each of those before closing. Visuals – After watching all these Disney movies so close together, I feel pretty confident in saying this film has some of the most vibrant colors of the whole bunch. The bright tropical hues and gorgeous vistas are astounding. The animation is smooth, and the CGI is integrated pretty seamlessly. Strangely, most of Disney’s top-tier animators chose to work on Pocahontas, which was also in development, for they thought it would be the higher-profile release between the two. The animators assigned to The Lion King were in some cases resentful of having to participate, many thinking the project didn’t have much potential. Still, they nailed it. Captivating Story – I’ve read the screenplay was based on the Biblical accounts of Joseph and Moses, and it was also derived from Shakespeare’s “Hamlet” and “MacBeth”. It certainly performs like the best of epics – the young prince is driven away by a jealous family member only to return and claim his rightful throne. On top of that, Disney was on a role with their comedic timing; the interjection of Timon and Pumbaa really balances the heavy story elements with humor. I especially loved the conversation about the stars – I feel like it’s a prime example of bringing levity to an important and heavy story moment. The scene where Rafiki hits Simba over the head to explain how the past works is another great example. Well-crafted Characters – Simba, Mufasa, Scar, Timon/Pumbaa, Nala, Rafiki, Zazu, Shenzi, Banzai and Ed – each of those characters is very well done. They each fill a role marvelously, and they generate the right feelings. We hate Scar for his treachery while loving Mufasa for his wisdom and power. We feel for Simba when he loses his dad and understand when he makes mistakes. We laugh at Timon and Pumbaa, and we have quite respect for Rafiki. Some movies never establish a reason why we should care about any of the characters, but in The Lion King, they all fill their roles extremely nicely. Well-crafted indeed. 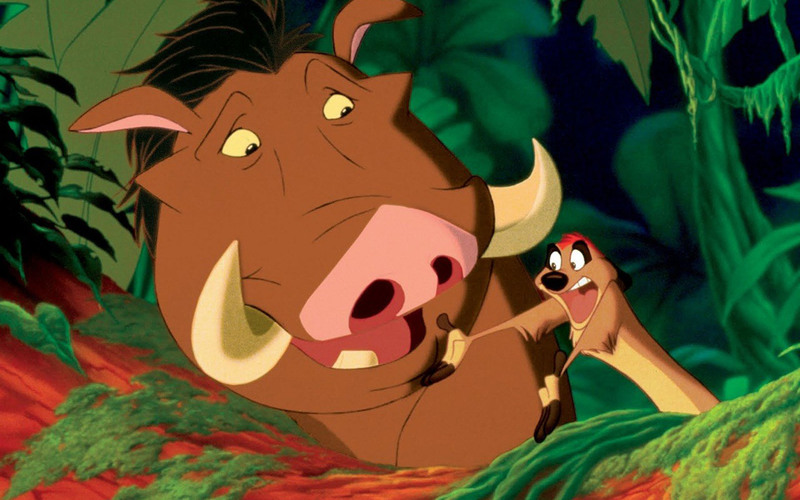 Timon and Pumbaa bring levity. Terrific Voice-Acting – Of course, the characters are only as good as the actors portraying them. In this case, the actors couldn’t have fit their roles any better. I particularly thought Matthew Broderick did a perfect job as Simba. Somehow, his voice still has a boyish quality while being mature. Not sure how that works, but it does, and incredibly well. Of course, James Earl Jones as Mufasa is a stroke of genius. His voice fit Mufasa’s persona just as well as Broderick’s voice fit Simba’s persona. In other words, it was perfect. And Jeremy Irons as Scar is brilliant. The only thing I remember from watching The Lion King in the theater was some guy in the audience yelling, “Scar’s an a**hole.” That audience member was and is exactly right. 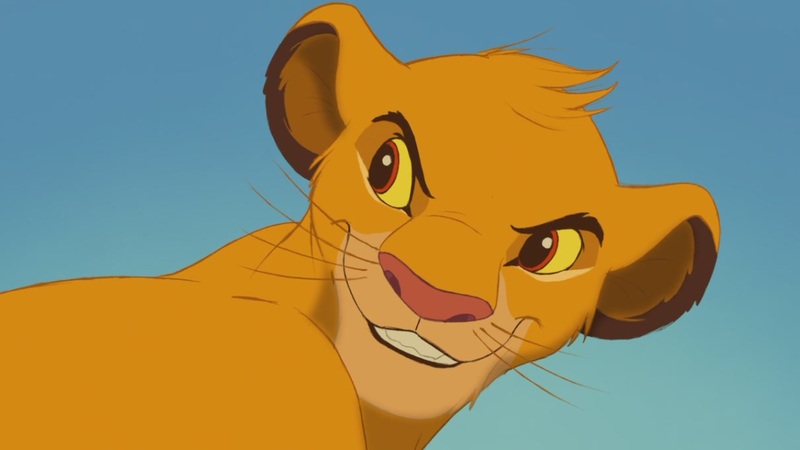 Scar is a complete jerk, all thanks to Irons’ great voice-acting. I could go on and on – pretty much every voice is amazing. Meaningful Message – I guess this could be lumped in with the section on story, but I feel it deserves its own attention. I found the movie to be filled with wonderful messages. From Hakuna Matata to responsibility to respecting elders, the film draws attention to several key life lessons everyone would do well to learn. Of course, the “circle of life” is the over-arching message, and it is a good one too. Disney has frequently done a good job of bringing not just a story but a lesson, and this movie accomplishes that in spades. 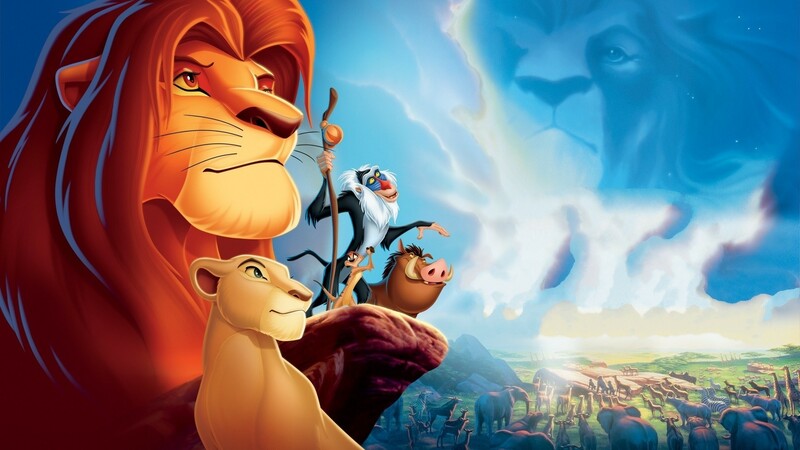 Simba is analogous to Joseph, Moses and Hamlet. Some of the Best Movie Music EVER – Well, I already mentioned the ‘Diamond’ certified soundtrack and multiple awards for best score and song. I feel there isn’t much more to say to establish the quality, so I want to draw attention to the three men most responsible for that success. By now, most people probably know Elton John and Tim Rice wrote the songs, and boy did hey annihilate it. ‘Hakuna Matata’, ‘Circle of Life’, ‘I Just Can’t Wait to Be King’ and ‘Can You Feel The Love Tonight’ – what a murderer’s row of tunes. I bet you can hum most of those just having heard the titles. If that’s not enough, Hans Zimmer wrote the score. What??? Hans Zimmer? Yep, Hans Zimmer. He drums up supremely awesome sonic textures in this thing, and it is breathtaking. In all, The Lion King is an incredible film. Several great elements come together to make the movie what it is, including beautiful visuals, a captivating story, well-crafted characters, a meaningful message and some of the best movie music ever. Most consider it one of the best animated movies ever, and so do I. 8.7/10. Grant Stevens is a big fan of animated films. He is thoroughly enjoying revisiting Disney’s traditionally animated catalog, and he hopes to one day win the Nobel Peace Prize for his work in reviewing these seminal films. While not watching gobs of movies, he enjoys basketball, Halo and learning about apologetics. He is also really into music. Check out his latest musical works at www.grantstevensgroup.com.